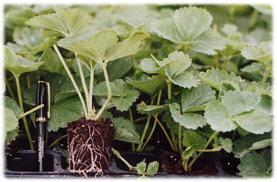 Strawberry plants for fall planting! Welcome to Strawberry Plants.com - your online source for top quality strawberry plugs. Plugs are one of the greatest new developments in the strawberry industry. Their advantages over bare root plants have been proven in the fields. We offer Chandler and Sweet Charlie strawberry varieties. Just like the name says. These berries taste like they have sugar on them fresh from the field. Sweet Charlie plants are vigorous, disease-resistant, and produce large firm fruit. Plants are medium in size making harvest easy. Sweet Charlie is an early season variety and generally produces 7 to 10 days earlier than Chandler strawberry plants. Hardy in zones 5 to 8 [Zone Map]. Festival plants are low-growing hybrid perennials prized for their sweet, aromatic red fruit. Fruit is large and firm. Festival strawberry plants resist fungal diseases and requires relatively few daylight hours for flowering and fruit set. Fruit holds flavor after shipping and makes a great commercial berry. Hardy in zones 4 to 9 [Zone Map]. This strawberry plant variety is similar to Camarosa in all aspects including production patterns. External and internal fruit color for Camino Real is darker than Camarosa. Subjectively, Camino Real has very good flavor. The fruit is outstanding for both fresh market and processing. Hardy in zones 4 to 9 [Zone Map]. A new variety of strawberry plant named ‘Ruby June.’ This new short day strawberry variety is an early season producer. Plants have medium to high vigor which produce large, firm conical fruit with great flavor, and an attractive dark red color. Hardy in zones 5 to 8 [Zone Map]. Our strawberry plugs are started in a controlled greenhouse environment to maximize quality and minimize damage caused by pests and diseases. The plugs are then moved outside to make them hardy before shipping to you. This process is used to provide our customers with the best possible strawberry plants.